Trigger Warning: This post discusses abortion. I was literally stopped in my tracks for a minute. I resolved not to say anything because I knew that if I started, I’d be unable to stop. As I got closer, I realised the woman shown above was chanting a prayer. She turned towards me and I was treated to the enlarged pictures she held. I don’t want to go into too much detail. I don’t know where she got the images. What I do know is that they were of late term terminations or possibly stillbirths- there were no reference points. I also know that late-term abortions are very rare and generally for medical reasons. As I moved further down the street, I heard a number of voices praying and looked up to find a small group moving up the street to join the first woman I’d seen. They had a big banner of the Virgin Mary, brochures and I saw one was wearing a tee shirt decorated with an outlined crucifix filled with images of foetuses. Someone pushed a baby in a pram but overwhelmingly, the protesters were men. Men, 100% of whom will never find themselves pregnant. I don’t know what my face was doing but again, they turned towards me then moved aside, quickly. I got my phone out again, to let the local police know of the new development. I knew this still happened. I’ve read about it on news sites, heard of people having to push through these crowds, I’ve seen it in films and documentaries and encountered it through my work. But this was the first time I’d seen it with my own two eyes and not as an abstract idea. The thought of people crowding outside a clinic like this always horrified me but to really see them beginning to form, carrying their banners and graphic pictures… I was shaking. Looking back at it now, a few days later, it’s interesting to note my physical and emotional response to these people. The pounding heart, the trembling, the anger and the outrage. And I was just walking past. How would I have felt if I had to walk through that to go inside? How would I have felt if that judgement and righteousness were directed at me? No one should be harassed and intimidated as they enter a clinic. These people have no way of knowing why a woman is there. Does someone suffering an incomplete miscarriage need to be assaulted with graphic images? Does someone who has weighed up the pros and cons of keeping an unwanted pregnancy need to be publicly prayed at, while having pictures thrust on them? 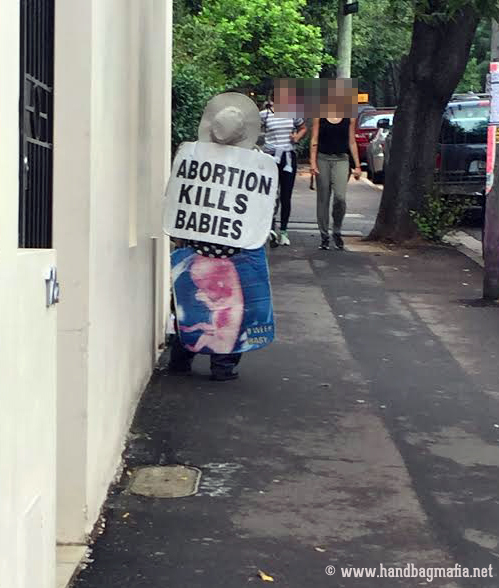 Does a person who has made what can be a difficult decision deserve to have images of foetuses and crosses held in front of them as they make their way into a clinic? No. No, they bloody don’t. I sincerely doubt these anti-choice protesters change anyone’s mind. All they do is harass, shame and intimidate women and people passing by. They reinforce a mindset that says women do not have the right to control what happens with their bodies. The laws around abortion vary from state to state and some need vast improvement, but the simple fact is that a woman entering a clinic for a termination is exercising her legal right to govern her own body and I wholly support that. In fact, as a pro-choice person, I support my right and I support your right to have a termination or not. I support you having the right to decide for yourself. If you do not agree with abortion, I support your right not to have one. However, I do not support your endeavour to take that choice away from anyone else. If you are against abortion for any reason, there is a simple solution: don’t get one. If the thought of other people getting them upsets you, remind yourself that you have no idea why they are doing so. Nor do you have any right to know. Their body; their choice.